The Destroyit 2604MC Microcut shredder is a high security paper shredder designed for Canada Government Approved (RCMP rated) use. 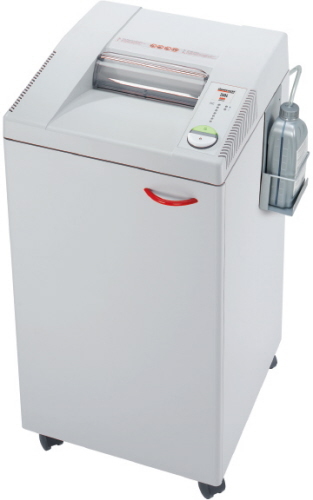 This Type II / Level 5 (P-6) model is designed for paper shredding only. The feed opening on this model is 10 1/4" and allows for 9 sheets (16 lb.) or 11 sheets (20 lb.) paper only shredding. The Destroyit 2604MC also come standard with the automatic oiling system (side mounted quick replacement bottle design). 1 year warranty on the cutting shafts. Quiet and powerful single phase motor rated for continuous operation. Sturdy Twin Drive System with fully enclosed gear box housing. High quality wooden cabinet mounted on casters. Convenient, environmentally friendly shred bin does not require disposable shred bags. This model is recommended for mid to higher volume work group and medium size office document destruction needs. It is the second highest class rating in this line up for high security shredding needs. Dimensions 18 1/2" x 22 1/2" x 36 1/2"
This shredder comes standard with Safety protection, Automated controls and energy efficient features and specifications. Automatic start and stop controlled by photo cell. Patented Electronic Capacity Control (ECC) indicator prevents jams by monitoring sheet capacity levels during operation. Automatic oil injection ensures optimal performance at all times. High quality, hardened steel cutting shafts. Meets all RCMP / Canada Government Approved specifications and is DOD approved. Easy Switch control element uses illuminated color codes and symbols to indicate operational status and functions as an emergency stop switch. Zero Energy Consumption sleep mode cuts off power supply after 30 minutes of inactivity. The Dahle 40330 is a RCMP / Canada Government Approved cross cut high security document paper shredder. The Dahle 40430 is a RCMP / Canada Government Approved cross cut high security document paper shredder. This model offers RCMP Approved rating of Type II / Level 5 for paper material data destruction.